Though he studied under Ben Graham and has adopted many of Graham's investing principles, the world's greatest investor is not your typical value investor. He speaks of margins of safety and of buying companies at discounts, but over the years Buffett has shown a willingness to buy businesses for what appears to be full price, at least on a P/E basis. What allows Buffett to do this and still generate excellent returns is his ability to understand economic "moats" better than anyone else. For example, making headlines this week was Buffett's purchase of BNSF (BNI), a railway freight business. While most value investors are using this recession as an opportunity to gobble up companies trading for low P/E and P/B values, Buffett goes out and buys a company for a P/E of 16 (using peak 2008 earnings as the denominator!) and a P/B of 3. Ben Graham himself stated that purchasing companies with P/E ratios above 16 amounts to speculation, so what does Buffett do but make it his largest acquisition to date! With the large size of Buffett's portfolio, his investment universe is fairly limited. While most of us have the benefit of being able to turn over every last rock to look for cheap companies, Buffett is limited to selecting from ocean-sized boulders. 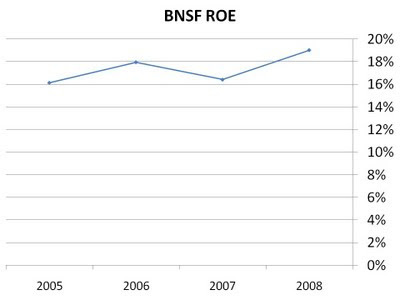 It is for this reason that BNSF offers an attractive investment opportunity for Buffett. With the ROE depicted above, Buffett will be able to allocate capital to this company (earnings from other businesses, insurance float etc.) and earn returns between 15% and 20%. If it were this easy though, couldn't all large investors and insurers follow this formula? The advantage Buffett has over everybody else, however, is his superior ability to understand competitive advantages (or "moats"): he believes/knows that the ROE depicted above will continue for the foreseeable future. While he will be second-guessed (always has been, and always will be), his ability to predict moats has proven to be second to none. Individual investors can certainly learn from Buffett, but are cautioned to avoid investing like him unless they know what they are doing. While Buffett likely benefits from having more information, more knowledge and a higher understanding of business than most investors, his major disadvantage is that his investing universe is so limited. Individuals are thus better off finding value in the analyst-ignored small cap universe where stock prices are the most inefficient and where companies trading at large discounts can be found. Very nice post Saj. Many so called Buffett followers, don't realize this fact. "The advantage Buffett has over everybody else, however, is his superior ability to understand competitive advantages (or "moats"): he believes/knows that the ROE depicted above will continue for the foreseeable future." Without trying to sound crass of course ROE will continue at it's current level he is buying a railroad (high fixed cost business and a monopoly) it's not like someone is going build a competeing railroad in the same area there will only ever be one and it will always be cheaper than trucking or shipping by air. It seems kind of like a no brainer in my opinion. The icing on the cake is really the price of oil. If it goes up then it just makes his investment more worthwhile. I am the webmaster of some finance sites having good web presence. I want to make 1 guest post in your blog on any finance related topic which yopu can chose for me., if you give me permission. The post will contain 300 words above and will be totally unique in nature. Please contact me at diana.perkins1983(at)gmail(dot)com . "Individuals are thus better off finding value in the analyst-ignored small cap universe where stock prices are the most inefficient and where companies trading at large discounts can be found." You overstate the case for small-cap stocks for individuals. Mid-cap and large-cap stocks provide significant buffers against downside risk, whether by events within or outside the control of management. And, as Buffet has shown, there is lots of value to be had in the mid-cap and large-cap realm. So the appropriate investment universe for an individual is not as clear cut as this fine blog would lead one to believe. Put another way: Buffet is currently restricted to large cap stocks, but that does *not* necessarily mean that if he had a small pool of money to invest and no such restrictions he would focus exclusively on small caps, which, almost by definition, lack some of the most important qualities that he seeks. I disagree with your assertion Korey that large cap stocks provide a buffer against downside risk. The only true buffer against downside risk is proper stock analysis and purchasing an equity at a discount to it's intrinsic value. Size has nothing to do with risk mitigation. Also if you read biography's written about Buffett or some of the early partnership letters you will see that in many cases when he had a smaller pool of money he was very much focused on small cap stocks that were very illiquid. In some extreme cases he was even searching out individual stock owners so that he could personally purchase their certificates from them a few lots at a time. I have been wondering about this acquisition myself for a couple of days, trying to understand it. It's easy to forget that the man is the greatest investor of our time (and possibly of all time) when news outlet label this latest acquisition as a GAMBLE! This reminds me of this video I saw a couple months ago, title Gates & Buffett Go Back To School. It explains a lot of things about how Warren Buffett operates as a businessman.